Sporty. Elegant. Modern. The Chrono Hawk Only Watch leaves nothing to chance, neither the design of its case, which associates bold edges and a round bezel, nor its face, which gives prominence to the measurement of short times. Its well-tested reliability and its exceptional finish are a testimony to fine craftsmanship. Contemporary and bold, the style plays with ceramic and palladium. Deep black and silvery-white and yet perfectly functional, the elements of the case blend into one another, while keeping their individual strengths to end up accentuating the watch’s architecture. The well-balanced dial showcases the time data. Two red counters face each other in perfect symmetry at 9 and 3 o’clock, while the date is placed at 6 o’clock. The applied hour markers and the hour and minute hands are lit with luminescent material. 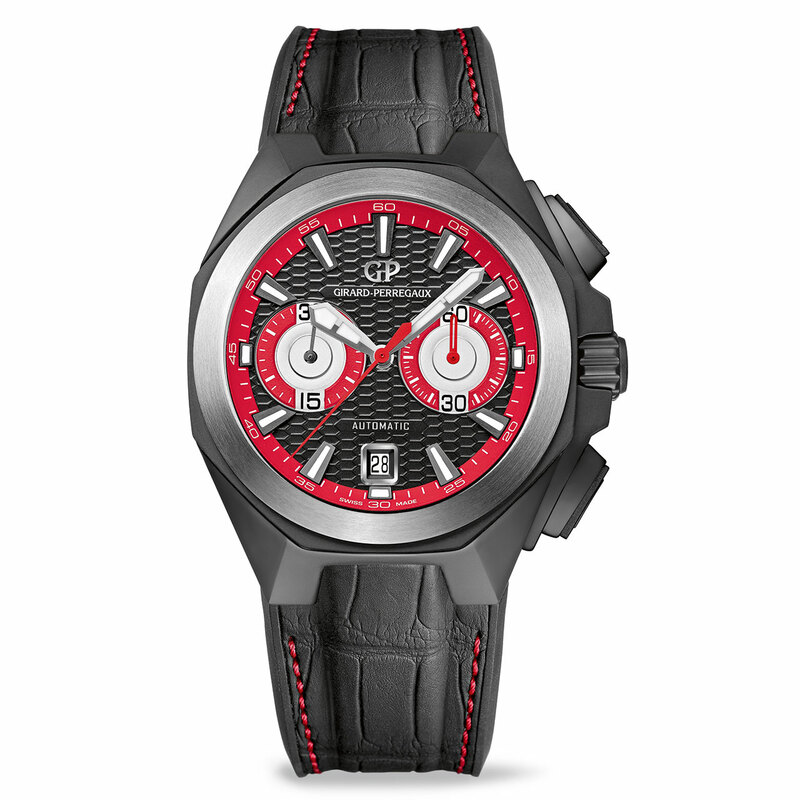 This classic layout is complemented with a motif inspired by the famous Girard-Perregaux Bridge. The character of the Chrono Hawk Only Watch is finally emphasized by the audacious rubber strap coated with a genuine alligator leather. Visible through the case’s sapphire back, the caliber GP03300, a self-winding mechanical movement, drives this very high performance unique piece.